Jim was never able to get Diana to do anything but straight stitch even with the new throat plate. We thought all along that something was wrong with the machine. He spent a lot of time with his voltmeter trying to troubleshoot the electronics. The problem was solved when the throat plate was removed and the foot control was depressed. This caused the machine to immediately start to zig-zag. Further analysis showed that there is a small micro-switch that is actuated by a correct throat plate for Diana preventing the machine from zigzagging if a straight stitch throat plate is installed--a very good idea, indeed. That is when we made the posting on a vintage sewing machine site looking for a throat plate. Subsequently, a very nice person provided us with one, and now our Diana is very happy. There is an arm on the bottom of our machine that appears to have something to do with creating button holes that isn't working properly, but as quilters, we don't make button holes so that lost capability is not problematic. Singer 560 Diana is a straight shank machine. 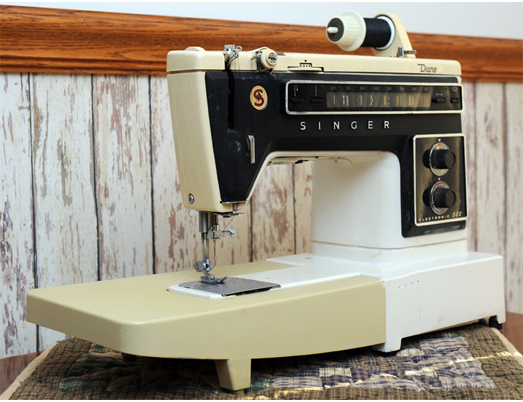 Many machines of this era like the Singer 500 are slant needle machines. One of the few problems we see with our machine is that the bed extension (shown here in a slightly darker color) is about 1/8 inch lower than the free arm. This causes problems for us sometimes when we have pinned fabric and if the pin is beneath the fabric, The pin will invariably get caught beneath the slide plate. When this occurs, the fabric will stop and bad things happen. With the machine pulling the fabric forward, and the pin stopping its advancement, it can be difficult to remedy the situation. We have threatened to make a piece of Lexan that is the same shape and size as the bed extension in order to make the overall surface level. The push-button that releases the bed extension is missing, so a pointed object (such as a screwdriver) must be inserted into the hole to trip the release mechanism. 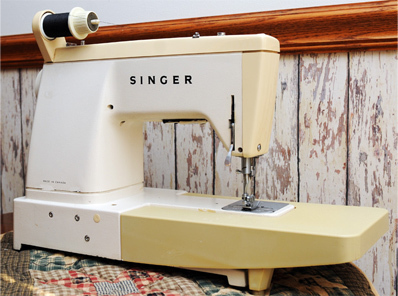 Singer 560 uses a horizontal bobbin as shown. 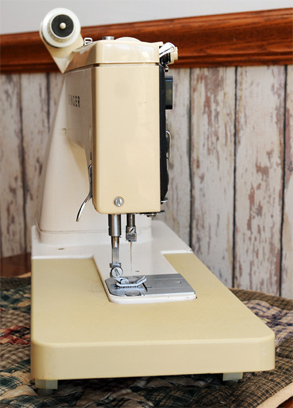 The bobbin is easy to install and we find that either plastic or metal bobbins work fine. We learned the hard way that just because a throat plate fits in the space, it will work for that machine. 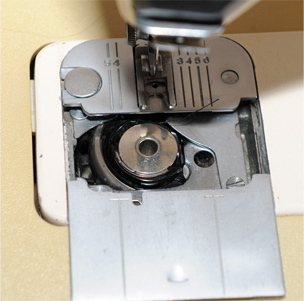 On the 560, when the straight stitch throat plate (the plate with a small round hole) is installed, it tells the machine not to do zig-zag or fancy stitches. To get these capabilities to work, one must install the correct plate for this machine. Serial number of our machine is J7017163.